With Cinco de Mayo approaching, it’s time to celebrate Mexican and Mexican-American culture. I wanted to do something beyond tacos to demonstrate the country’s rich and varied food culture, and so I present Sope de Albondigas, or Mexican Meatball Soup. In Spain albondigas are often simmered in tomato sauce and eaten as tapas. 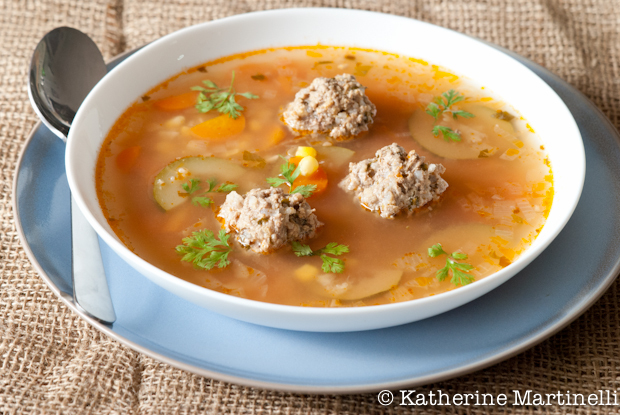 Because of Spanish colonization in the Americas, meatballs are also called albondigas in Mexico, Columbia, Nicaragua, and other parts of South and Central America, where they are typically served with rice and vegetables in this mildly flavored soup. I love how versatile this soup is. Use whatever vegetables you have on hand; corn, potatoes, celery and bell peppers are also particularly good. Make the meatballs with pork instead of beef, or a mixture of both. There’s also a version with chicken instead, and others where the rice is in the broth instead of the meatballs. I like how the rice in the meatballs expands and sticks out a little as they cook, making them look like little porcupines. This versatile meatball soup is popular in Mexico and other parts of South and Central America. Make gluten free by omitting the breadcrumbs or replacing with a gf alternative. In a large bowl, mix together the ground beef, rice, breadcrumbs, cilantro, parsley and egg. Season with salt and pepper. Refrigerate while you get the soup started. Heat oil in a large soup pot over medium heat. Add the onion and garlic and cook until softened, about 5 minutes. Stir in the tomato paste and cumin. Add the chicken broth. Bring to a strong simmer. Add the carrots. Remove the meat mixture from the fridge. Form into 25 to 30 small meatballs, dropping them into the simmering soup as you go. Cook, covered, for 20 minutes. Add the corn and zucchini and cook for another 10 minutes, covered. Season with more salt and pepper to taste. Serve and garnish with additional chopped cilantro, if you like. Make gluten free by omitting the breadcrumbs or replacing them with a gluten free variety. Thanks for another great Friday party Katherine! google +’d it for you! Thanks, Katherine – looks delicious, as always! Your soup looks lovely and I’d like a bowl right now! I can eat soup anytime. Thanks for hosting the blog hop! By the way, I am headed your way on Sunday. Meeting my mom and a touring group from Houston for two weeks in the Holy Land. Can’t wait! Mmmm…I love Albondigas – especially with rice in them. This sounds delicious! Thanks Katherine, looks like a great celebration here!! Thank you for hosting. That soup look sooo good but I am a vegetarian!! I am thinking that I can make meatballs with beans and TVP instead….sounds like an awesome project! I am hosting today as well at http://www.frugalfitfamily.com ! Feel free to swing by and link up your party if you have time! Gosh, I haven’t made this soup in years! And it’s so good. Great job with this and lovely pictures. Thanks! Thanks for hosting such a fun theme today Katherine! Wonderful post Katherine and I would love to have this soup with rice for my dinner. Its delicious and light. I love this soup. It has always been one of our faves because it always hits the spot!